Product prices and availability are accurate as of 2019-04-13 16:01:38 EDT and are subject to change. Any price and availability information displayed on http://www.amazon.com/ at the time of purchase will apply to the purchase of this product. The Beveled Easy Sort Faucet Washer Kit contains 200 assorted beveled faucet washers to in seven different sizes. The kit includes: (1) Box, (30) 1/4" Small - Brown, (25) 1/4" Medium - Blue, (50) 1/4" Regular - Blue, (25) 1/4" Large - Purple, (35) 3/8" Regular - Grey, (25) 3/8" Large - Light Purple and (10) 1/2" Regular - Pink. 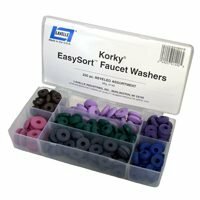 "LAVELLE" KORKY EASYSORT FAUCET BEVELED WASHER KIT Sturdy, plastic box with hinged cover. 7 color-coded sizes in identified compartments.